Support this blog by shopping on Amazon here! On January 29, 2012 I published this article. It’s funny that the argument is still going. Not only the old school versus new school skaters but the idea that the rules of new school are broken. The argument that if it “ain’t fast it ain’t derby”. 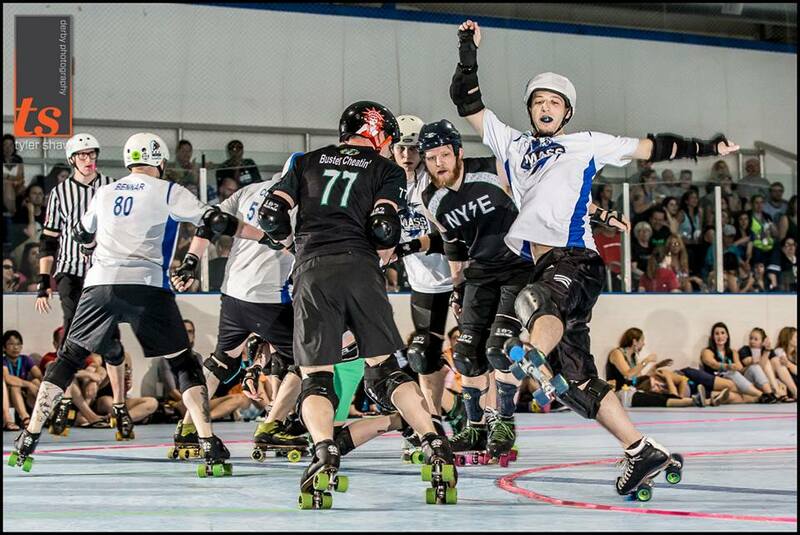 Yes the Puget Sound v Your Mom game was an awesome one at MRDA Champs last weekend. However, the more staccato, stronger-yet-sometimes-slow Southern Discomfort against Bridgetown Menace was no less exciting. Anything italicized, ps, is different from the original article, I didn’t want to re-write this. It was popular for a reason the first time around. The photos have also been updated. Old School vs. New School. Strategy vs. Smash ‘n’ Grab. 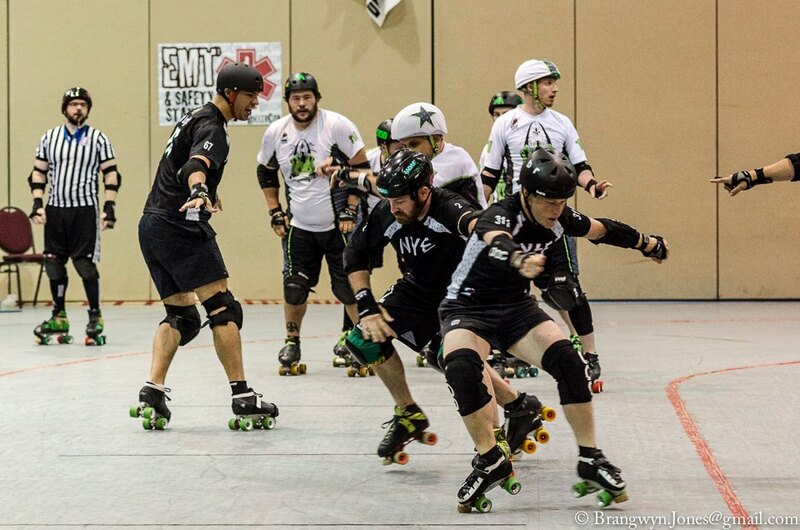 Jammer Line vs. Pivot Line. Booty Block vs. Big Hits. Rules vs. Free Form. Beer & Camaraderie vs. Cross Training & Team Commitment. Sharp, Strong, Stops vs. Fast, Fluid, Sweeping. These are the dichotomies that have bubbled to the surface of the sub-culture of derby. A generation gap has arisen between the vets of “the good ol’ days” and the skaters of the modern culture. Since the new revolution of roller derby started (back in 2001), the landscape of the sport has shifted considerably. When it was first gaining momentum, skaters and leagues were looking to the tradition of 1970’s over-the-top antics for inspiration. They had to learn how to play the sport from the only people that had played the sport. The result was a show of big hits, cages as penalty boxes, personas and spectacle. Game play was spotty during the early years. Leagues were figuring out through trial and error what worked, what did not; what was dangerous and what was just fun. The game was unrefined. Those who were drawn to roller derby wanted to together with friends, to hit things and drink beer. It was not about refining strategy and being at your healthiest. 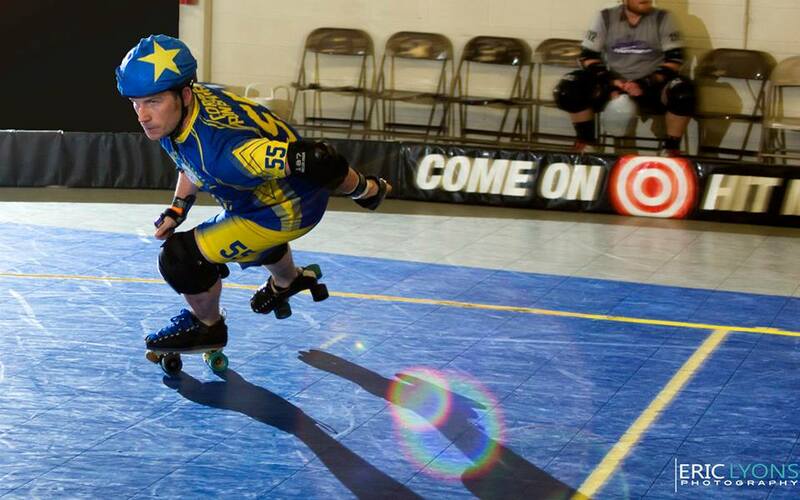 The ultimate goal of roller derby was to have fun, skate really fast and hard, and maybe, be a little bit of show. 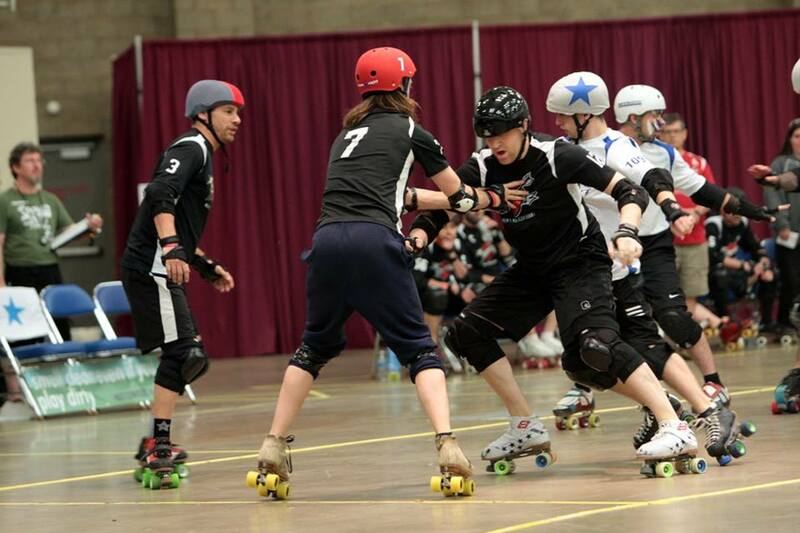 WFTDA Derby looked a little different in 2010. When leagues started (the boom of flat track roller derby really started at the end of 2005), girls who are now legendary did not know how to skate. Everyone was new. Other than the speed, jam or artistic skaters that joined the ranks, few girls were adept at the art and skill of roller skating. Forget putting a sport on top of that! This is what made the game unrefined for a while. Everyone was still learning their balance and stability on eight wheels, so being agile and clean on a grand scale was near impossible. Most skaters do not want to wait seven years, and they realize that if they cross-train, improve their diet and treat their body like a professional athlete, they will accelerate exponentially. There has been a health revolution! More leagues are partnering with gyms and personal trainers. More skaters are paying attention to their nutrition and workout routine off the track, because they realize it will have a direct impact on their performance during game play. Lifting. Yes. It’s a thing I do to get better at derby. 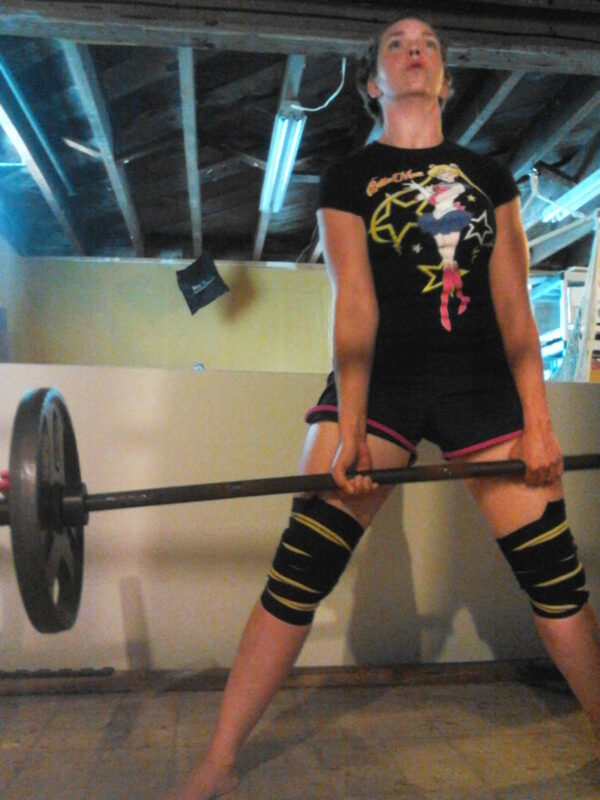 Deadlifts are awesome for all the things. Support groups and workout routines focused on derby have emerged. The Roller Derby Workout Challenge ran for three years. The Derbalife Big 5 Challenge has operated several times; both are challenges designed to teach and motivate. Derbalife is skater-centered nutrition that includes skater-to-skater coaching. Learn about Derbalife. Winning is fun, and the way to win in 2012 (and even more now in 2014!!) is to be strong of body and of mind. Speaking of ‘mind’, game play and strategy have changed dramatically in the last three years (five years!). 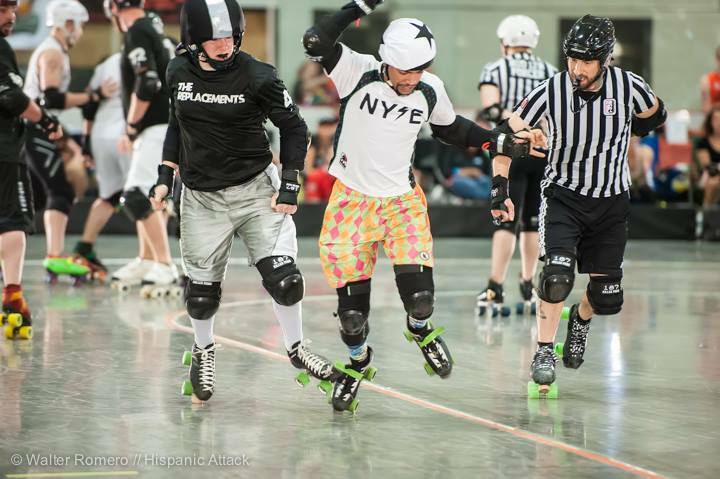 Since the inception of W.F.T.D.A., skaters and refs have taken note about what works on the track and what are health hazards. While the rule set that has evolved over the years can be confusing to the untrained reader, it is so because it has developed organically. If an established rule continually gets challenged, interpreted differently at different bouts, or has shown itself to not protect the skaters, it has been changed. One of the best features of the W.F.T.D.A. set up: voting member leagues have been able to shape the sport itself over the years. Modern Note: And for the M.R.D.A. the ability to look through the rules and make any further clarifications or adjustments as their organization feels is needed. Now, we get to the crux of it. Because skaters have shaped the sport over the years, skaters have been able to control how they want the game to be played. The best leagues are able to look at the rules and understand the implicit meaning behind the rules. Most leagues look at a rule set and understand what it says. The winning leagues are the ones that understand what the rules DO NOT say. From what the rules do not say, a league can exploit the loopholes and skate circles around leagues that do not understand the implicit meanings. So, this causes a bigger need to pay attention to detail. In order to compete, every league must understand the new loopholes and strategies being used by the leagues around them. It means watching bout reels. It means watching other bouts. It means extra strategy sessions. It means extra hard training at practice. Those skaters who do more outside of practice to understand the game and new skills and tactics will be the ones most successful in scrimmage, and therefore in bouts. Five years ago, girls could walk into a league and party. They could practice twice a week, play dirty and laugh about it later because they would still make the all star team. They would still win games. They would still be super stars. No more is it the case. 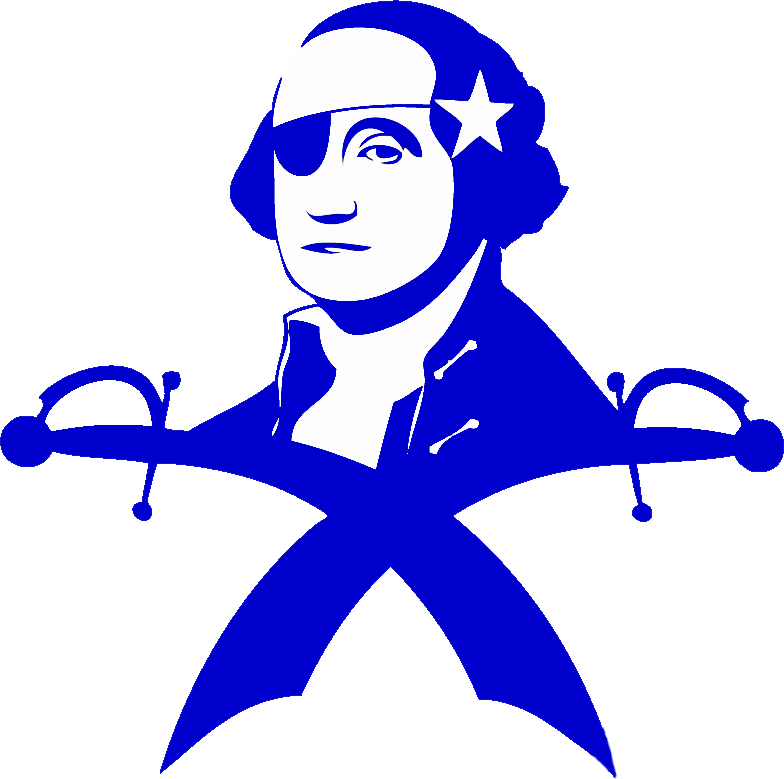 Drinking teams with a derby problem do not exist in the modern world of roller derby: it is an ‘adapt or die’ sport. Skaters who do not care about their craft simply do not skate on high level all star teams, and even the smallest leagues are becoming highly competitive. Leagues that do not care about their strategy do not win. When you do not win, you do not have fans. You lose skaters to more serious leagues, your sponsors drop off. You perish. So are “the good ol’ days” of derby gone? Maybe, but the motto of “Skate hard, turn left” endures. There are still bruises to show off, rink rash to brag about and beers to buy after a hard fought bout. Rivalries still happen, and what happens on the track still stays on the track. The game may feel different than it did in 2006, and the training may be far more intense, but it does not make any of it less awesome. 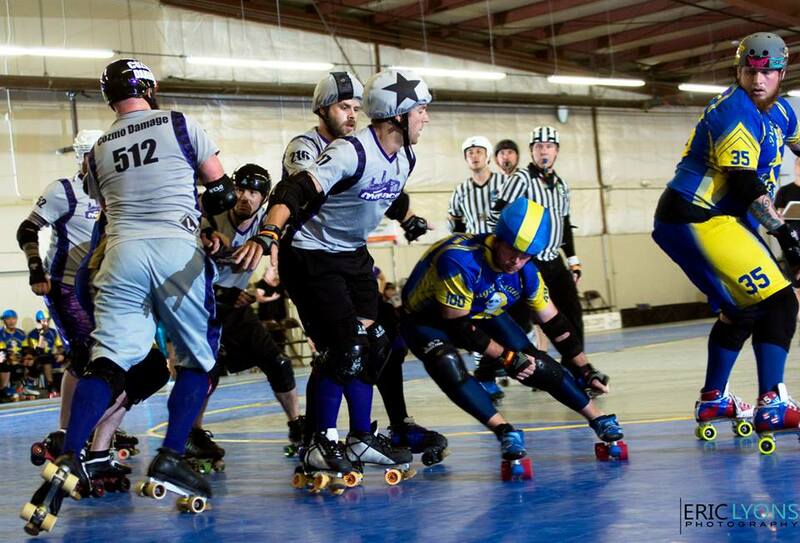 Whether beers and brawlin’ or hydration and smarts, roller derby is a uniquely intense sport. The vets should be proud of the foundation and history they created. The current generation should be just as proud of how they have cultivated their craft and shaped modern roller derby. Now … who wants to hit open skate? 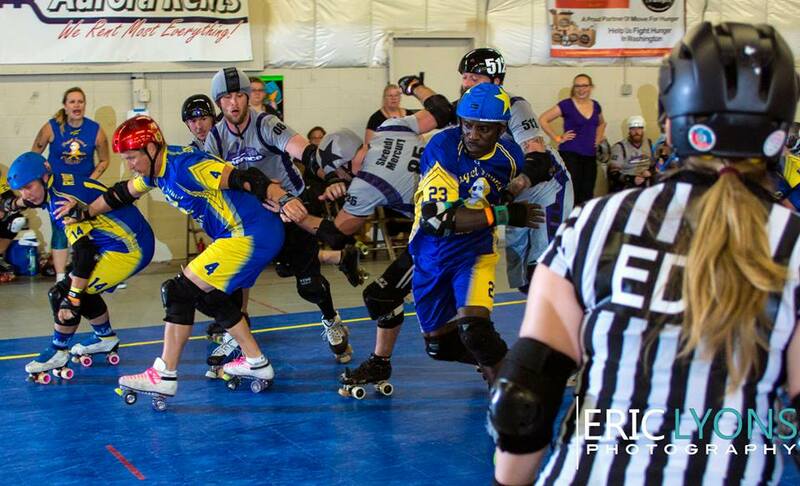 Thank you Harrisburg Area Roller Derby, David Dyte and Danny Ngan Photography for use of the photos in this blog! As you progress through the lists, thoughts and derbys please remember that the background for all of this should be enjoyment. Drop the ego and HAVE FUN! It’s just f***ing roller derby, and I think we all forget that sometime. Everyone has a tip to offer, and some of these probably sound familiar. Being in my fourth season, I have been through a lot of ups, downs and across many plateaus. So here is my humble insight. 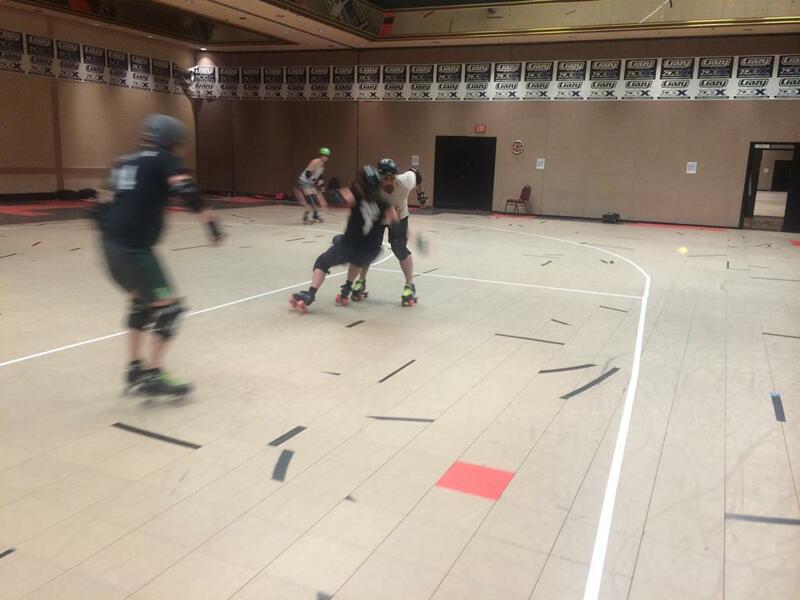 Photo: ParaNorma of the Susquehanna Valley Derby Vixens has fun during an open skate event hosted by As the Bearing Turns. Photo by Toxic Shock. Step one to getting better is spending time on your skates. Any vet will tell you that. What they may forget to tell you is that it’s not just a matter of skating circles. Getting better on your skates means that you are challenging your balance and your confidence; it means you are pushing yourself to improve. The easiest way to challenge yourself is simply to goof around when you roller skate! Throw yourself forward and backwards. Hop. Go to open skate or an outdoor rink with your friends and skate backwards, turn, play games. The more comfortable you can get on your skates in odd positions or pulling a balancing act, the better you will be able to control yourself during drills and gameplay. Playing MADE rules on a bank track, watching junior derby, watching men’s flat track, scrimmaging men with MADE rules on the bank track, going to open flat track scrimmages, watching the All Star bout at NEDC. You never learn when you’re in your comfort zone. Just like with going to open scrimmages with new people and throwing off your balance at open skate, playing and watching unfamiliar types of derby will teach you techniques and strategy more than you think is possible. Seriously. I love that damn tri-block. 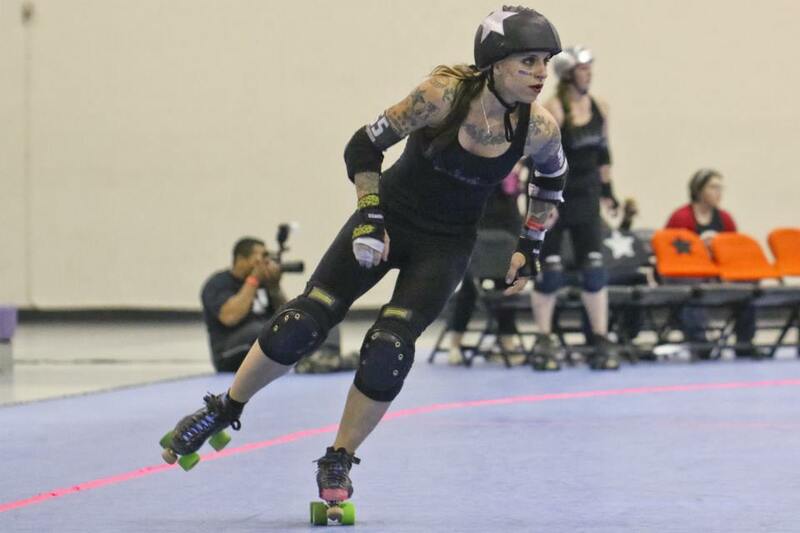 RollerCon has some awesome classes for skaters of all levels. No. Really. Go to the events and trainings. The world of roller derby is so much more expansive than it was when I joined in 2009. Back then, we felt lucky to get a guest coach for the night and we all dreamed of having the money to make it out to the only collection of trainings available – Rollercon. The times, they are a-changin’! Not only are there a ton of boot camps and trainers available (DNA Coaching, Derbalife,Getsome Athletics, Left Turn Coaching among others), but there are more conventions and events than ever! 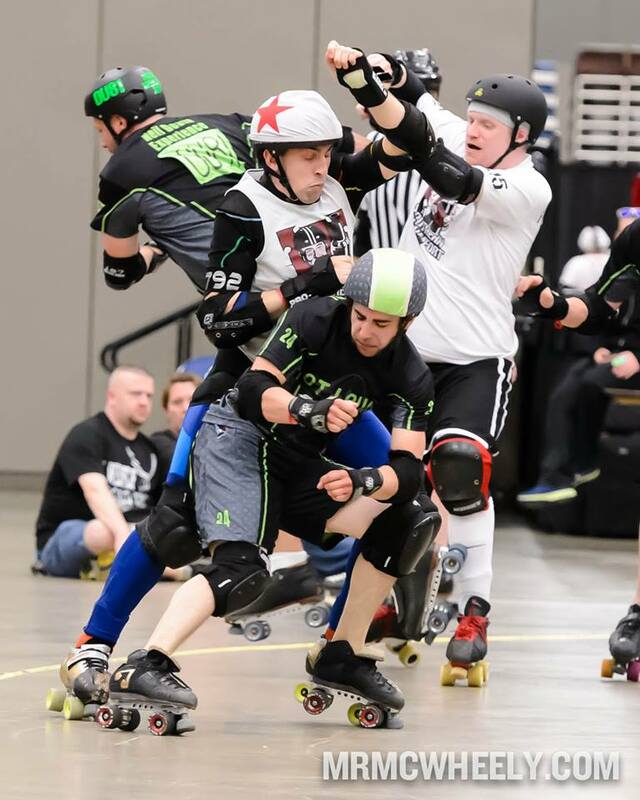 This past weekend the Northeast Derby Convention had a successful second year. Beat Me Halfway promises to be an awesome time, as does the addition of classes at Virginia is for Shovers. And this is just a small piece of the training pie. Leagues are now able to bring in guest coaches or boot camps whenever they want. Elite leagues also hold camps throughout the year to train and coach skaters. And just because you’re a vet doesn’t mean you can’t benefit. I did a Team USA boot camp last summer next to Holly Go Hardly (most would say she ‘doesn’t need’ training , but there is no perfection in roller derby and some of us always strive for more). At NEDC this weekend, when coaches weren’t coaching – they were in other classes! Do you know how many friends were geeking out about being in a class with Demanda? Or Punchy? Always strive to be better and take the training when it is available – if it’s not available, seek it out or bring it in! Photo: DNN may be gone, but DerbyLife and other publications (like mine!) still are around. Photo by Ryan Starr. Bout recaps, new skill explanations, boot break-downs. Read it all. Absorb it. Seek it out. Funny memes. Blogs. Discussion groups. The more knowledge you have about derby off the track, the more you can apply to your footage viewing, your live consumption of derby and your own on-the-track game. Derby News Network, DerbyLife, FiveonFive Magazine, Rollout Magazine, Blood & Thunder, Inside Line, Elektra Q Tion, RollerDerp Tumblr, Khaos Theory and more… they are are all great places to hear about thoughts on derby, derby related life and how derby works itself into other aspects of the world. Go and read some stuff. When I joined roller derby I decided that suddenly, I didn’t have to do cardio outside of practice. I thought I could use the occasional weight machine at Planet Fitness – and that would be enough. I avoided anything outside of derby, made faces at it, and was absolutely convinced that I could just skate more and that would be enough. In 2012 I decided, finally, to become a runner and cross-trainer. And in 2012 I became the derby player I should have been previously. Cross-training gives your body a chance to develop the muscles and stabilizers that derby doesn’t work on. It doesn’t work on them, but can utilize them. Incorporating strength, interval training, plyo metrics and other sports (I’m a fan of rock climbing and kick boxing myself) will give your body extra balance, strength and endurance that you can use on the track. Show me one elite skater that hasn’t cross-trained. That’s what I thought. Want to learn more about real crosstraining for derby means? Check out my Shifting Perspective article. Watching yourself can be brutal. Watching video should not be an exercise in negativity. It should be an exercise in study and analysis. You need to be able to watch what you and your team mates did and deduce what worked and what didn’t. To be able to think about how you could move or position differently in the future. To think about where you are and what you need to work on next. Visualization after you watch video can really help you incorporate your findings. Take 10 minutes after you watch bout footage (and you can do this with any team’s footage, not just your own!) and play out the scenarios in your head. Imagine your reaction, the quickening of your breath, the sliding of your wheels against the floor. Create the images of what you see and how you feel and what you do next in different situations that you saw in the footage. Imagine yourself conquering the situation and bursting past the blocker, spinning through a wall or blocking a jammer out of bounds. Visualization is an amazing tool to give to your unconscious. 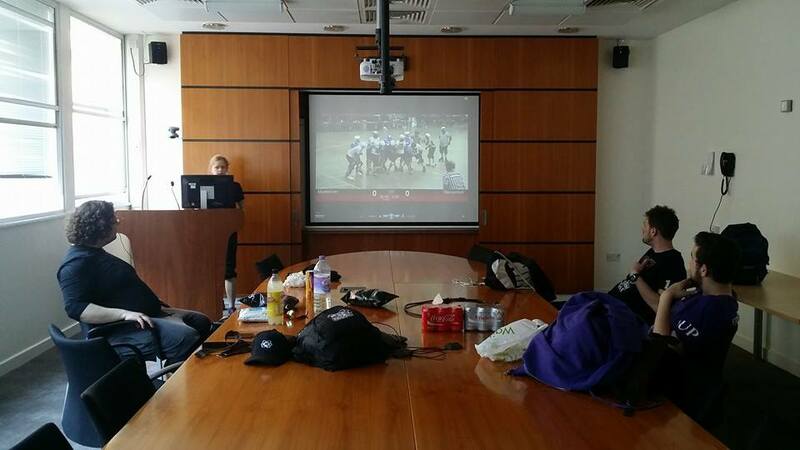 Remember that watching bout footage with your team mates of OTHER bouts is super important too! Not only will it help you talk through the strategy of other teams, but it’s a bonding experience for you to all know derby a little bit better. You can talk about what teams did that work, didn’t work, or what you think you could incorporate into your own blocking or jamming styles. Team derby-time is awesome. We all love scrimmage night. All of us. It’s why we put on our skates and deal with freshmeat training and months of knee fall and hip checking drills. We may say that there are other reasons that we do the roller derby thing – but let’s call a duck a duck. We do it for the PLAY TIME. Taking advantage of your scrimmage team with your team I very important: here you learn how to interact with each other. You build bonds of trust and you learn how to react and rely on each other. Another important piece of this puzzle is taking advantage of OPEN scrimmage nights that other teams have. Why? At open scrimmages you can learn how to react quickly in new situations. You can learn how to adjust to new floors, new opponents and new obstacles. Also, it’s a great way to make friends in derby and learn how opposing skaters play (could be useful in future games, don’t you think). Plus, remember why we are part of derby? PLAY TIME! Yes. I said it. Go visit another league to get practice at it. Volunteer to help your league if you’re team doesn’t have a bout coming up. Reverse the roles now and again so that you can see the game from a new perspective. Remember, you aren’t learning anything inside your comfort zone. Not only will you get a new perspective on gameplay, but you’ll have a new found respect for refs. 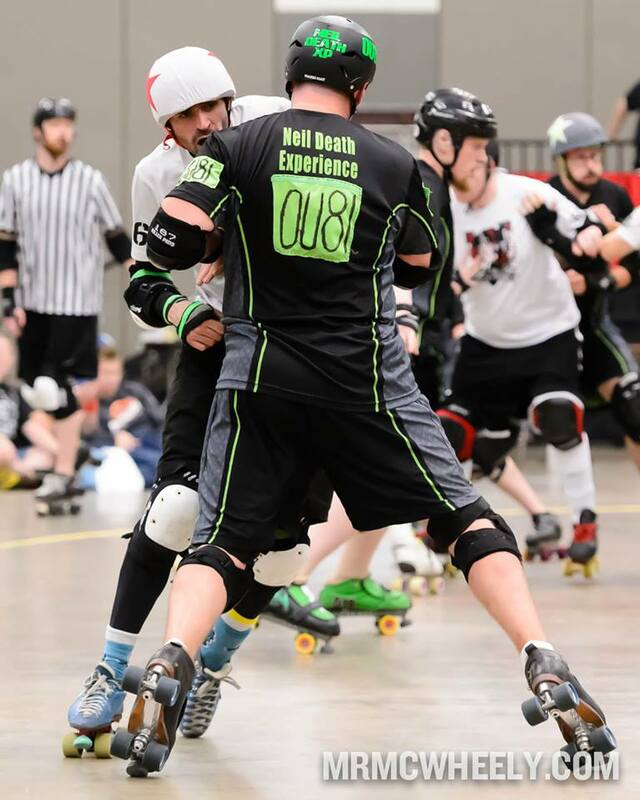 Part of being a ‘better derby skater’ is keeping your cool on the bench during a bout. Not getting riled over penalties will help you keep an even demeanor and a clear head in each jam. Best way to understand the refs is to put yourself in that spot. I bet you’ll be surprised at how hard it actually is. Aside from that all, you get to give back to the sport that has given you so much. When you’re not skating, help others to skate! Don’t have the attention span for a zebra huddle? The NSOs could use a hand, too. I have found that setting goals is best to do with a buddy. Captains and coaches are preferable, but if you have someone in your league that you trust that you want to go on this journey with, that’s awesome too. Remember that goals should be SMART (specific, measurable, attainable, realistic, time-specific). To set a goal such as “Block better in the next bout” is a goal that you cannot hope to measure and it’s certainly not specific. Say instead: “Practice blocking techniques 3 times a week for a half hour for the next 4 weeks.” Through the practice of it, you will become sharper and thus, “Block better in your next bout”. It’s a matter of phrasing and giving yourself something to focus on. For example, the photo is from May of 2012. I had decided that I wanted to be the top scorer for Harrisburg Area Roller Derby against Providence Roller Derby. (In 2010, I had the star taken from me because I couldn’t break their walls. This was redemption year.) Instead of making the above statement my goal, I worked on the strength in my legs, running and plyometrics. The photo is me and Craisy Dukes getting our MVP awards for that bout. And yes, I was top scorer. Vision boards are awesome too. I’m a big fan of writing down your goals and putting them in places you can see them so that you’re reminded of them daily. Mixing that with positive images and mantras, your goals will crumble under your powerful skates! Just like with cross-training, I thought I had my pulse on “good eating”. Truth be told, 90% of us in derby have no idea what we’re putting in our bodies or why it’s not good for us. Yes you have some folks that are uber informed (I am now) and then others who like making a joke out of their lack of nutrition (go ahead and have that burger and Red Bull, I want to see how many times I can lap you). I thought my diet of farm food and whole grain was awesome. I couldn’t figure out why, after 2 years of skating, NOTHING happened with my skill level or my body. Turns out I didn’t know everything. 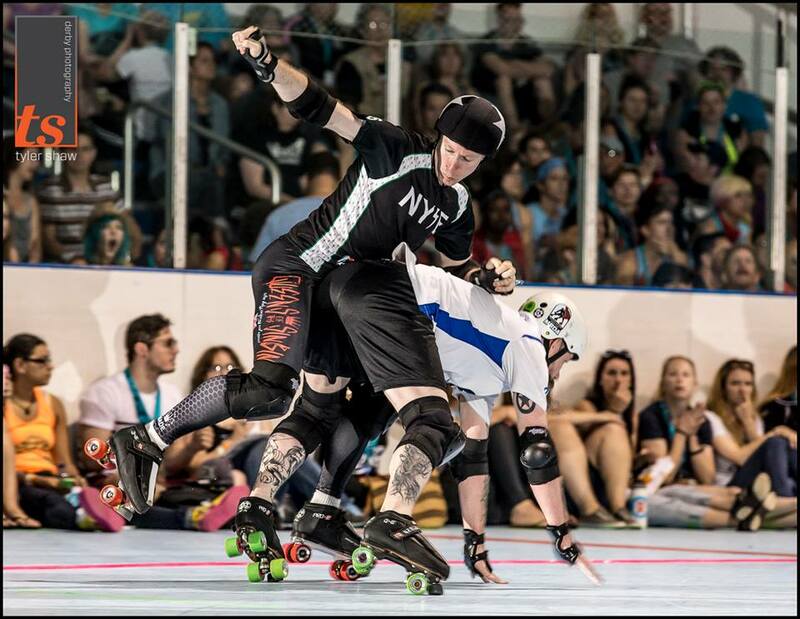 There are lots of diets, regiments and philosophies that have been coming into the world of roller derby. It was only a matter of time. The health and wellness industry in America alone is a multi-billion dollar one. Some programs are based in science and research, some really are not. I, personally, confine myself to dietary restrictions for performance reasons that I have imposed on MYSELF. We all have different goals, and your program should reflect those goals and desires. Protein. 35-40% of your calories should come from protein. If you’re really looking for a quick adjustment to your diet and want to go at things hard? Think of consuming 1g of protein for every pound that you weigh. Hydration. Half your body weight in ounces. Minimum. Daily. When in doubt, drink a gallon. We’re made of water. How can we function as humans if our cells don’t have water? How can our body flush toxins (like the by-products of lactic acid) if we’re not hydrated? This is just good sense, people. No, you will not be at risk for water overdose. Unless you drink that gallon in a very short period of time. Vitamins. Guess what? You’d have to eat about 3500 calories of fruit and vegetable to get your recommended daily amount of the 65 vitamins and minerals the body needs for function. Now couple that with the fact that your body needs it throughout the day (it flushes vitamins it can’t absorb at the time), so that one-a-day you’ve been taking is mostly ending up in the sewer line. Oh yea, if you’ve been eating poorly for the last X number of years, it means your body isn’t even able to capture all the vitamins you put into it because, chances are, the good bacteria in your body isn’t healthy. Vitamins need to happen 3x a day MINIMUM in a dose of about 30% of your RDA. Metabolism. Keep the furnace going throughout the day. You should be eating small meals 4 to 8 times a day (depending on your size and activity level). When you go 5 hours without eating it means the metabolism shuts off. Vitamins aren’t being distributed. Protein isn’t being used. Calories aren’t being burned. No good at all. Quick burning carb are bad if you’re trying to lose fat. Complex carbs are good – like in vegetables, sweet potatoes and quinoa. Quick burning carbs like bread (yes, even stone ground, whole grain), pasta and corn spike your blood sugar and turn to fat in your body more often than are burned off. That being said, in sports like roller derby, it doesn’t hurt to have a little extra padding. If you’re weight lifting or doing lots of activity, don’t be afraid of adding in carbs. Look, if you want to talk nutrition more (Derbalife or not) send me an e-mail at DerbyAmerica@yahoo.com. It’s kind of what I do when I’m not writing things like this. The biggest piece of the derby puzzle is confidence. If you do not believe in yourself, then you are never going to be successful. I’m sorry if that is harsh, but I have seen too many people self-sabotage because of their own self-doubt or because of toxic influences coming from their personal life. You are good enough to play this sport. Every single woman, man and child can be as successful and strong as they want to be. It just is a matter of time, effort and having the mindset to go along with it. You are not going to be Suzy Hotrod overnight. It takes a combination of all the things listed here (and more) to get you to that level. It takes years of dedication and focus. If you want it to come quicker, you have to work harder. If you quit the moment you get tired, or your feet hurt or you sweat … guess what? Your league has plenty of Non-Skating Official positions that are ready for you to help with. Everyone has a different gauge on accomplishment and everyone has a different bar they want to conquer. What commitment is really necessary for you to hit yours? Take a hard, honest look at what you are doing now. In life and in derby, the cancer of negativity will kill your hope, drive and spirit. You must be diligent to be a happier person with a positive outlook. Maybe you can’t do a 180 toe stop. Do you say “I try really hard but I can’t do it.” Or do you say, “I’m going to work on it UNTIL I can do it.” That’s the difference. That’s the key. Need a help with this part of the puzzle? Personal development readings, audios and videos are amazing for your mind. May I suggest some Les Brown, Jim Rohn or Eric Thompson? May I suggest TED Talks? Reading books likeThe Slight Edge and The Big Leap. Believe in yourself the same amount your coaches do and you will do amazing things. 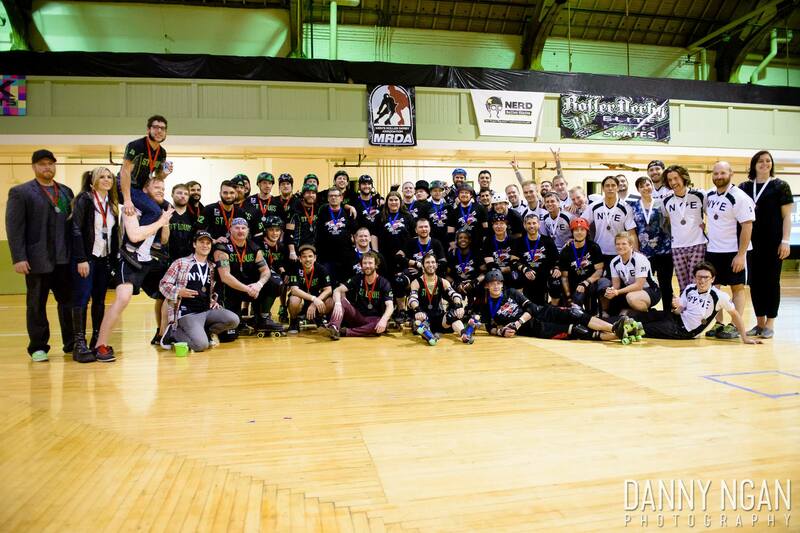 Two time MRDA champion, Your Mom Men’s Roller Derby is a collection of some of the most talented skaters in the world who also just happen to be phenomenal at roller derby. 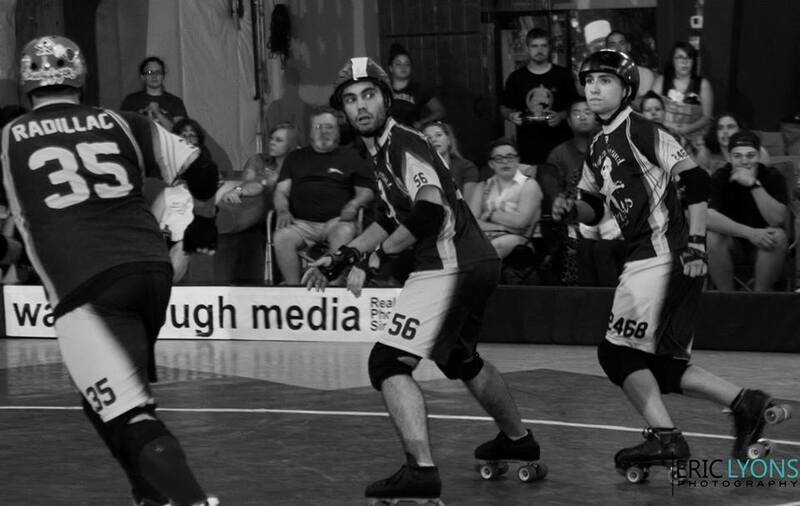 Disclaimer: I talk about roller derby pretty real at a couple points in this blog. This is not meant to make anyone #butthurt (as Elektra Q Tion would say), but if a blog about derby can’t say it, who can? Your Mom is known for fast skating, and intense walls. When you watch them, they are not hard hitters – they don’t have to be. Their non-verbal communication and self-awareness is so sharp that if they rarely have to hit opponents to contain them. Their work is smooth and effortless. Hits are not short strikes, but rather elongated motion that carries the intended target out of bounds, or drives the target behind the blocker’s hips. Edges, edges, edges. Study it. Their bursts. Their control. Their awareness. Your Mom knows what you’re going to do before you know what you’re going to do. They aim for where you’re going, not where you are, and they rarely have to catch the jammer, because the jammer is so commonly ensnared in their net. How do you know that their blockers are interchangeable and their rosters fluid beyond measure? Think about this: Who are their big hitters and which jammer has the best differential? Sure, Seahorses Forever and Sugar Boots stand out because of their height. Yes, everyone knows Frank NotsoHotra. Otherwise it is hard to picture any skaters that are exceedingly more important than the others. On every other team you can look at a line up and pick out ‘key pieces’. Sure, every team SAYS they don’t have any players that are more important than the rest, but we all know that’s not true. Double Excel. Magnum PIMP. Jonathan R. Szabo. Dilly Dally. Speed Dealer. Cozmo Damage. Shreddy Mercury. Richard Gaudet. Wes Turn. Sutton Impact. Reaper. Keith Rucker. TJ Binkley. Are these the only players that matter on their teams? Absolutely not! Do you want to beat that their teams would be a tad concerned about overall performance if one or both of these skaters were missing from the line up? Yes, I honestly think so. On Your Mom they don’t have to worry about it as much. No Cleveland Stever? You’ve Dirty Larry. No Tony Muse? You got Dante Muse. No B Stang? You got Rollomite. No Sugar Boots? You’ve got Seahorses Forever. No Lily Pad? You’ve got Suicide Snow Cone. You getting the idea? There is no one on the roster that Your Mom can’t respond to with a “But we’ve got these 5 people that CAN do it”. And they have up and coming skaters that they’re training so that the tradition of winning continues. There are 3 remote skaters that I know of. And by “remote” I mean living more than 3 hours away. And even if there were more, so what? Charm City, Philly, and Tampa Bay Men’s (for example) all have skaters that travel upwards of 3 hours to play with their teams. 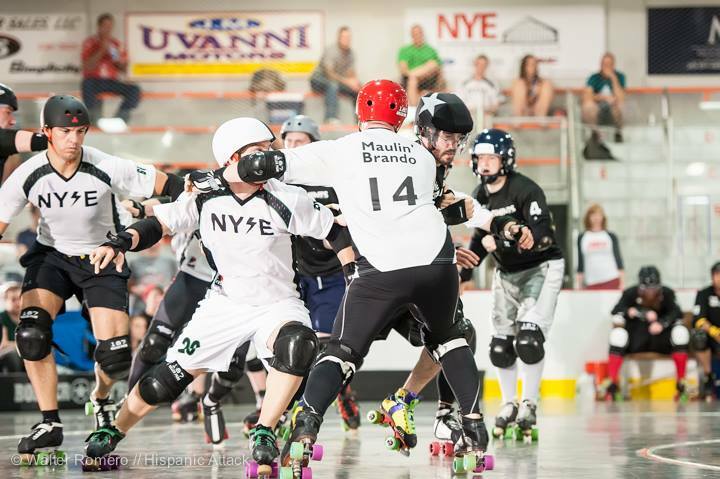 Those skaters could play for Charlottesville, or Suburbia, or Brevard Area Men’s, but they have chosen a different league and has made a commitment to the league of their choice. It is a hobby, we don’t get paid, so why should anyone feel that they are not allowed to play with the league of their choice? 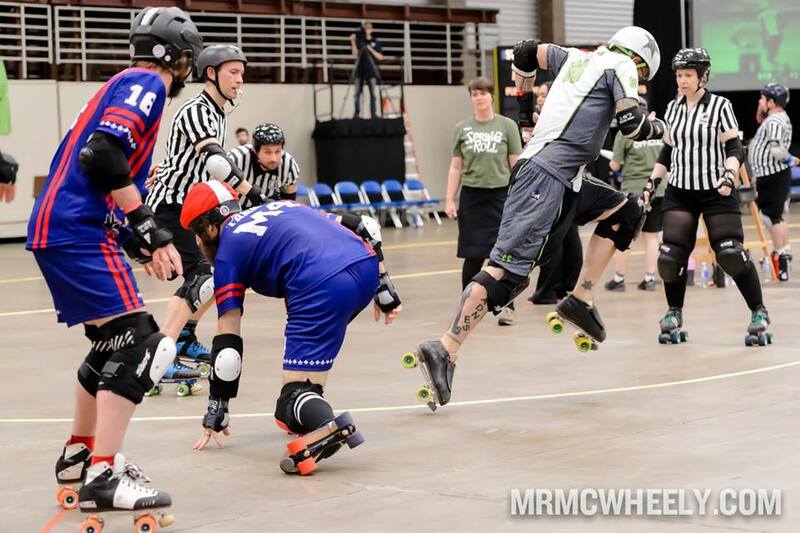 Why do we not hear about the skaters that travel across state lines to be a part of PRG or CCRG or TBMRD? Because they’re not world champions. As soon as a team starts winning division titles (Oly) or champs (YMMRD), suddenly it’s an issue. Jack Hammer’d lives in South Carolina (everyone in the MRDA knows that he moved, so I’m not exactly revealing a scandal). He is here with Maelstrom this weekend. Why? Because he fulfilled the attendance requirements set forth by his league, and thus qualified to play at Champs with Mass Maelstrom. Here is your tiny bit of beeswax so that you can mind your own. And guess what? We saw from the WFTDA championships in previous years that sheer talent doesn’t win titles, teamwork, and practice time does. 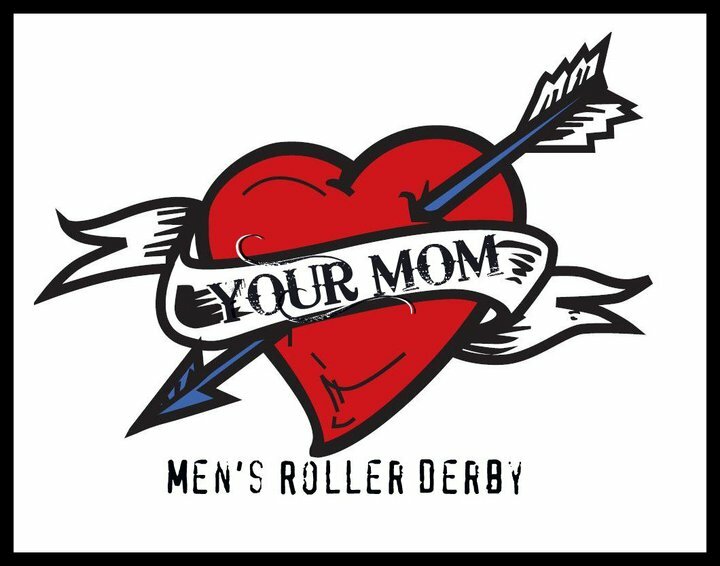 Your Mom Men’s Roller Derby has teamwork, communication, and ‘synergy’ (that’s for you, Austintatious). That doesn’t come from a bunch of people randomly showing up on bout day and not ever practicing with one another. This weekend is going to be tough for teams to oust Your Mom as champions. Many of the men on the roster are very accustomed to a sticky hardwood floor like that of the Tacoma Armory. Several of the skaters were GLOWING at the opportunity to play Champs on such a surface. Every team that faces Your Mom is going to have to bring the strongest walls, the ability to multitask, awareness like woah, and the endurance of a Champion. The GateKeeper defense are the thing nightmares are made of. Like the 2000 Baltimore Ravens of eggball, the GK have line-ups of monsters that have one objective: Ruin your jammer’s day [and do it as a team]. Another old dog of the MRDA, GK has been growing since Magnum PIMP and Bat Wing decided to form the league in 2009. 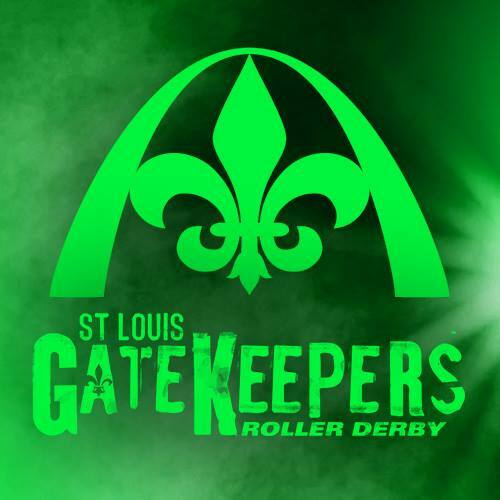 With over 50 active members, the GateKeepers (and their highly competitive B team the B-Keepers) strive to bring a balance of speed, communication, airtime, and pure pain to the roller derby track. This season, GK appeared at Spring Roll and RollerCon. From an outside perspective, ti seemed that they approached these two events with one goal: Establish unquestionable dominance over every team they meet. And, for the most part, they did. Gnat King Kill getting it done at Spring Roll against Southern Discomfort. If you’ve ever seen GK play than you know that they rely on super strong blockers who are huge AND have amazing lateral motion across the track. Coming up against a wall of Monster Jam, Double Excel, and Neil Death Experience is a terrifying prospect [and I am not even skating this weekend]. Not only does each take up the entire track by themselves, but they know how to seal holes to prevent jammer breakthroughs and their timing is all excellent. Mixing in blockers like Bane-Ana, Debaucherous Prime, and Gnat King Kill into lines help to keep the GK diamonds fluid and fast. These are the blockers that can dart out of a pack and pick off a stray jammer or destroy an opponent’s brace to give Shane Bower some space to run. “The Totes Adorb” Bane-Ana and Wrecking Bill team up to hold Jonathan R at RollerCon. Photo by Brangwyn Jones. In every article I have talked about teamwork. The GateKeepers exemplify what it means to have teamwork. What it means to understand how your allies on the floor skate, and how to pick apart an opponent as a two or three wall, instead of as an individual. BUT if the time comes where an individual needs to make a quick save, they know who is bridging, who is chasing, who is baiting the pack to speed up, and how to recycle back to that massive concrete wall. The only time the GateKeepers get in trouble is when they start landing in the box. Yes, obvious statement, but true nonetheless. I don’t have the stats packs to prove my point, but I remember GK getting into some penalty trouble against Shock Exchange, and that’s when NYSE starting getting a little more ahead. When they finally took hold of the NYSE game is when they calmed down, worked as a wolf pack, and ate the NYSE jammers and blockers alive [while NYSE let them at least]. While Screecharound and Shane Bower both have the long, beautiful legs that allow them to take flight each bout [without effort]. Both skaters are able to switch up between long, loping strides and the small, controlled edgework to fake out opponents. Shane Bower has a little more experience under his belt, and you can see it when he comes up against stronger walls. He’s deft at playing offense for himself by simply shifting his weight as he approaches a pack and trying out different spots in a wall until someone over commits and he can easily glide through. He seems to find holes in defenses unperceivable to the human eye on the physical plane. Then there is GateKeeper founder, Magnum P.I.M.P. Magnum is to be feared with the star. He is strong, he is light on his feet, and he has a head for the game. He understands his blockers, and how they move on the track. His offense understands him and can create the smallest distraction for him to take full advantage of. He is definitely a utility jammer. In the first round the GateKeepers will be coming up against a relatively green Southern Discomfort. While the men from England are ready to make a statement, they are going to have to pull out all the stops and have a stellar game to make a dent in the GateKeeper strategy. 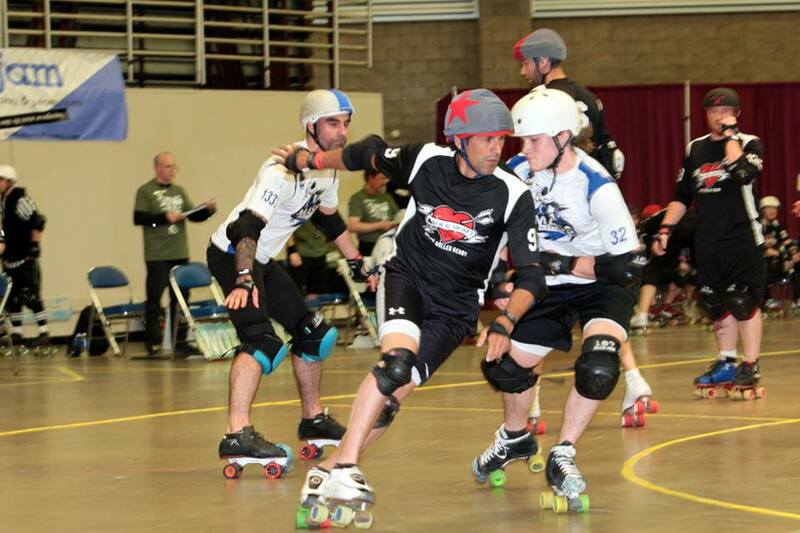 GK’s jamming bench is deep and wide, and their blocker rotation is so versatile that the SD jammers are going to have to continually readjust to the styles thrown at them. Do I think So Disco could come out with a surprise for the GateKeepers? Absolutely. True. However, look at the circumstances: SD played GK the last game of Spring Roll in Fort Wayne, Indiana. The GateKeepers had a 6 hour drive to the venue, and had only played two other games that weekend. Southern Discomfort was 6 hours out of their normal time zone, and had already played six games in the previous 8 days (including games against Mass Maelstrom and Your Mom). So Disco did not come into that bout as they will come into this one: Fresh, studied, and hungry. However, there is still the fact that they’ll be facing off against the St. Louis GateKeepers who are on a mission for Your Mom. You can see the GateKeepers work to hold back the British Invasion at 11a PST on WFTDA.tv, if you’re not at the MRDA Championships live. Check out the GK facebook page for updates. Thank you Mr. McWheely for the photos in this article. Visit his page to buy prints! Thank you also to Brangwyn Jones. You should totally go like him on Facebook. And New York Shock Exchange is making a good case that they’re going to do exactly that at Champs this weekend. 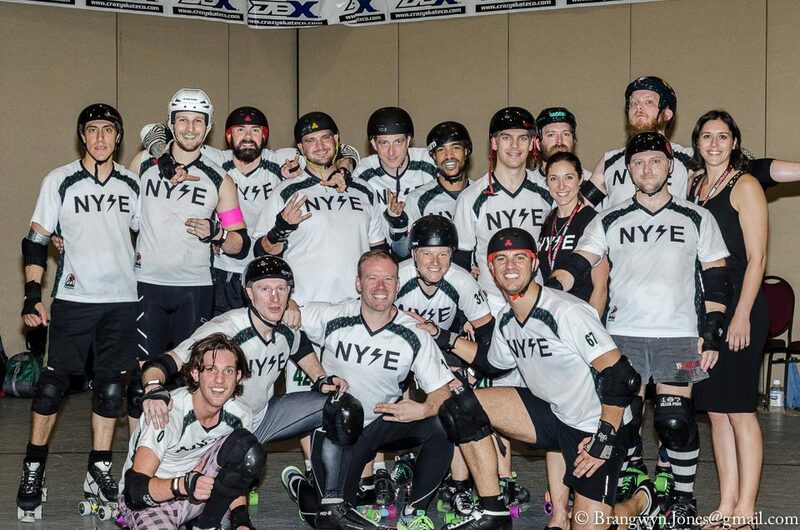 As one of the oldest leagues in the world, and the first champions of the MRDA, NYSE has a long tradition of work ethic and dominance. Coming into Champs with a full, healthy roster (and a fire in their eyes from dropping to the #3 ranking) means that NYSE is going to battle every team like it’s the final. Being an East Coast girl, I’m pretty familiar with the men of NYSE. 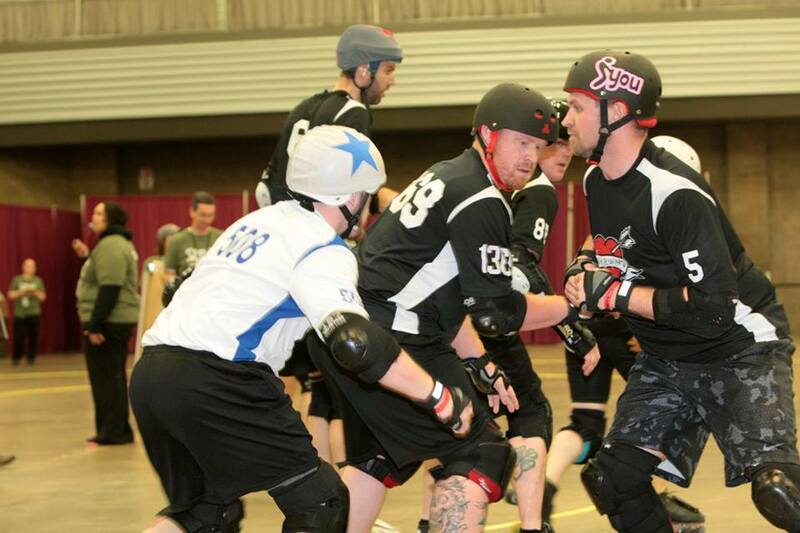 Their friendly rivalry with Mass Maelstrom is the best we have seen in MRDA the Northeast. Getting the opportunity to go to Coney Island and see the evolution of NYSE over the years has been awesome. We have a continuous drive to be better and push beyond barriers. This is exemplified in our commitment to having regular practices in perpetuity as we seek out new ideas. That being said, NYSE has had [in the past] the same kind of problem that Puget Sound has. The older teams have a style of gameplay that can only be labeled “SuperStar”. NYSE, in the past, has simply been more talented on their wheels than their opponents. NYSE would rely on their jammers to do all the work, and their blockers would spread out, take swings and make huge hits (with a high rate of success) and it was enough to win. 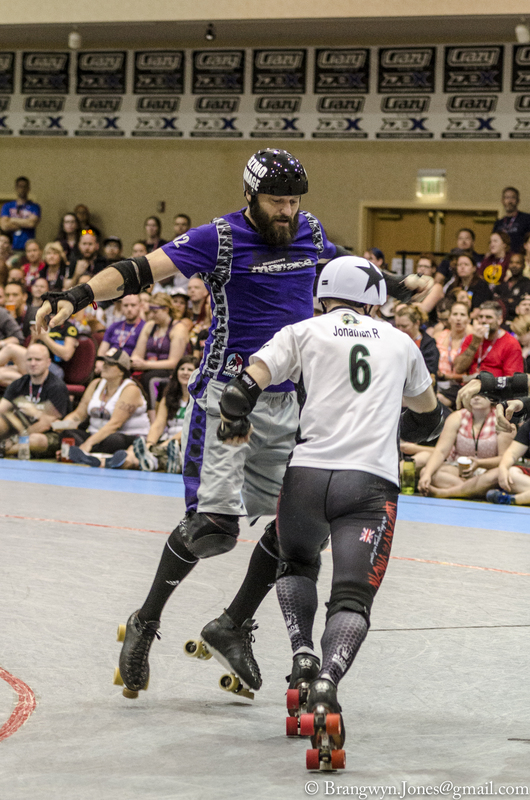 KenboSlice goes toe to toe with Menace at RollerCon. Photo by Brangwyn Jones. As other teams have started closing the gap in the last couple years, NYSE’s style has shifted. You still see shadows of the SuperStar play, but now you have power blockers like Buster Cheatin’ and Chris Szabo pulling the team together into walls. 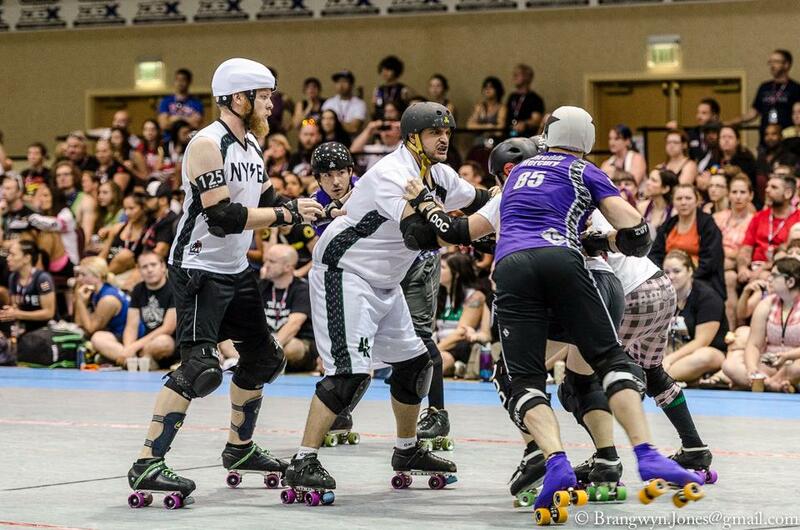 Walls which thwarted Mass Maelstrom by a significant amount both times they met this season; Walls that saved them against the Bridgetown Menace at RollerCon. Shock’s style of teamwork in a pack is a bit unique to other teams (again, more similar to Puget). While they work together, and move as one fluid unit, they don’t have the contact with each other that other teams do. When watching Southern Discomfort (for example), the men link to teammates until engagement begins. While NYSE always clusters near each other, the links are never as prominent (I have noticed). The downside is their partner may be slightly further than desirable, the positive is that it saves them on the multi player blocks, forearms, and high blocks that plague many Top 8 teams. Plus, the skill and awareness of the skaters let them get away with this kind of ‘dropped arms’ linkage to one another. NYSE sticks close to contain WildStyle of The Replacements at the Mohawk Valley Cup. Photo by Hispanic Attack. We shall see what happens at Champs with this. Mass Maelstrom is coming in with a bit of a chip on their shoulder and are focused on squarely and definitively beating NYSE. Their fluid diamonds and tight packs could be trouble for NYSE. If NYSE wins, they will square off against Southern Discomfort or the GakeKeepers. GK was the only loss of the year for Shock, while Shock was the only top 4 team that So Disco didn’t skate against when they came across the pond in the spring. All teams that face NYSE really have one thing to worry about if they want a shot at winning: NEUTRALIZE THEIR JAMMERS. Particularly Jonathan R and Carnage Asada. Based on what I saw at RollerCon, they better keep a tight beat on I A M Havoc as well. I don’t even know how to explain how good Jonathan R is. It almost makes me mad when I watch him skate because I can’t wrap my head around how his simple, concise moves can translate into COMPLETE OBLITERATION OF THE DEFENSE. The man rarely looks like he’s even working. 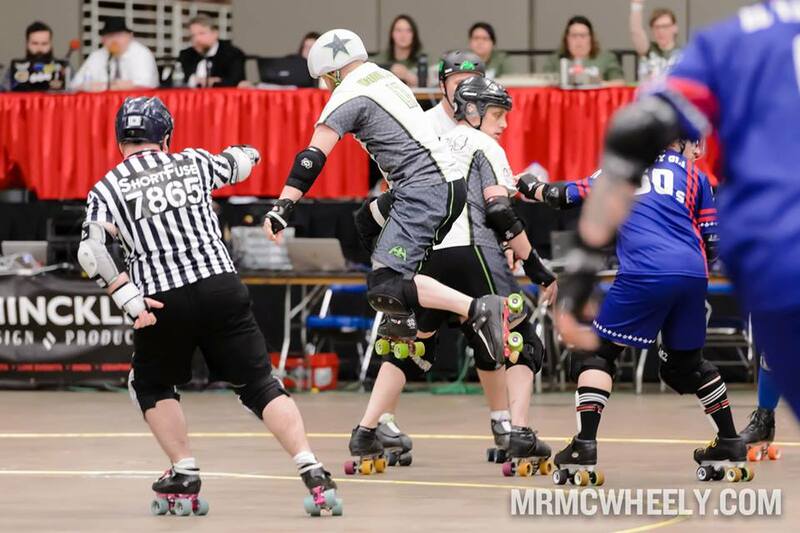 He is fluid, has complete control over physics (he may be a Time Lord), and even when he’s making RollerCon look like a CSI crime scene – the man is smiling and cheering on his team. Carnage Asada doesn’t have the same ease to his skating that Jonathan R does. Highly effective with long legs and toe stop action to die for, Carnage’s plan is to make you over commit on your hit. He is patient and quick, breaking down a line one by one. Defenses are constantly having to shift from long fluid blocks and holds to contain Jonathan R, to the staccato speed of Asada. It makes them lose their rhythm. It simply works. Carnage Asada does his thing at Mohawk Valley Cup. Photo by Hispanic Attack. Havoc is up and coming for sure. A new Shocker, Havoc had been on the Dow Jones average to develop is skills. If Carnage and Jonathan had a jamming love baby – it would be Havoc. No, seriously – don’t make that face at me. Havoc has fluidity in his ducks and jukes, but can stop on a dime and use lateral motion to throw off the opposition. Still adjusting to the speed of the game, Havoc hasn’t always had success against teams, but in the GateKeepers bout at RollerCon the entire crowd got to see him Level Up. 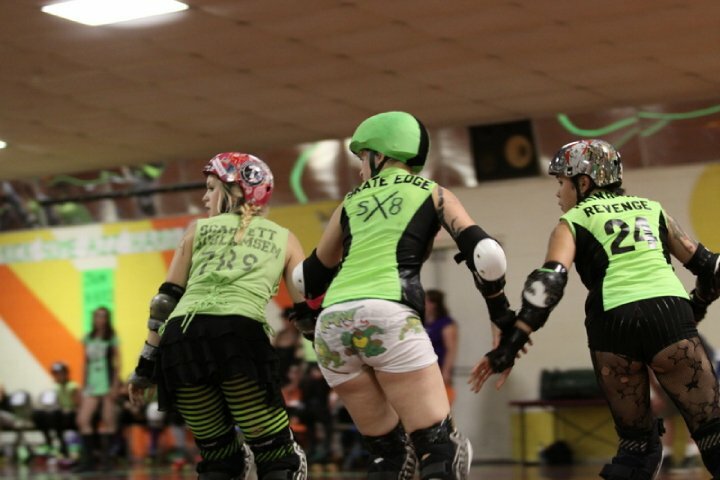 The slippery minx that is I A M Havoc at the Mohawk Valley Cup. Photo by Hispanic Attack. In fact, I would say all of the NYSE rolled over experience point to gain a level during that GK bout. I’m going to say the thing that everyone has been thinking and whispering but no one has said in a public forum before: NYSE, in the past, has relied too heavily on jamming skill. Particularly Jonathan R’s magic feet. When he suffered a nose bleed at RC, the GK’s score steadily rose, Shock looked a bit lost without their fearless leader. But then they figured it out. Then, the entire bench of Shock had this moment where every single skater stepped up and made adjustments and did whatever they had to for success. 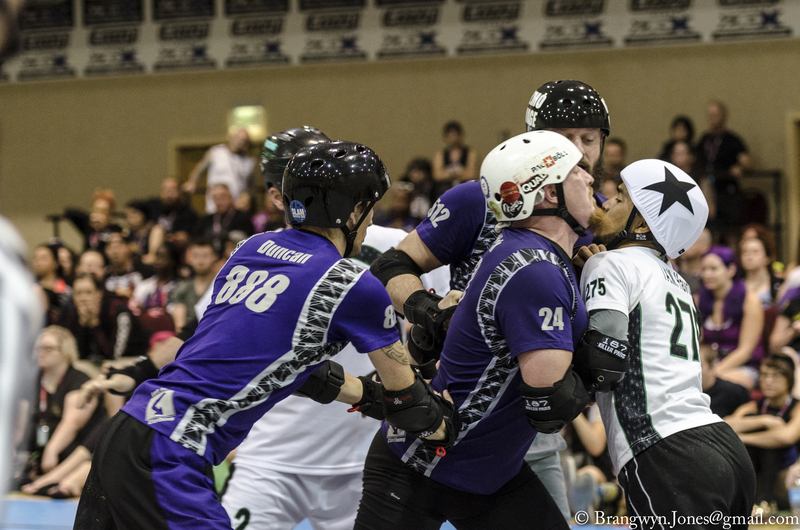 Every jammer that was a secondary brought their game to the level that Shock needed it to be. 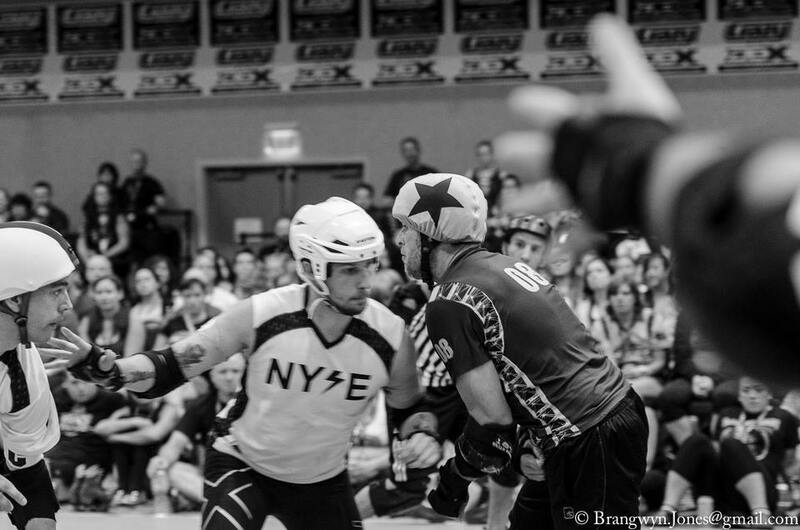 NYSE works as a team against Bridgetown Menace at RollerCon. Photo by Brangwyn Jones. If that team shows up for Champs? If Shock Exchange has maintained that level of “We need to do this as a team, we can’t rely on our jammers alone” – there is no question in my mind that they will smash through the first two rounds of their bracket while barely breaking a sweat. If they don’t work as a team, if they allow Maelstrom’s blockers to dominate in offense and defense, NYSE is going to have a hard bout ahead of them. Teamwork at the GateKeepers at RollerCon. Photo by Brangwyn Jones. Regardless, Shock is coming to play and I have a feeling we all are in for some amazing hard-hitting, strategy-driven, blow-your-mind roller derby. 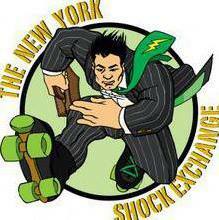 Make sure you check out Shock Exchange’s Facebook to keep up with all the awesomeness that they have happening. The Dow Jones Average, NYSE’s B-team, is in the middle of an UNDEFEATED season! If you can get to a bout, you need to. Also, NYSE is raising money for SHOCK DOWN UNDER!!! They’re going on a tour of Australia with bouts and clinics on the docket, and they need a little help getting there. The FB has all the details and how you can support the strengthening of Men’s Roller Derby around the globe! Get hooked up with some rad NYSE merch at their online store. 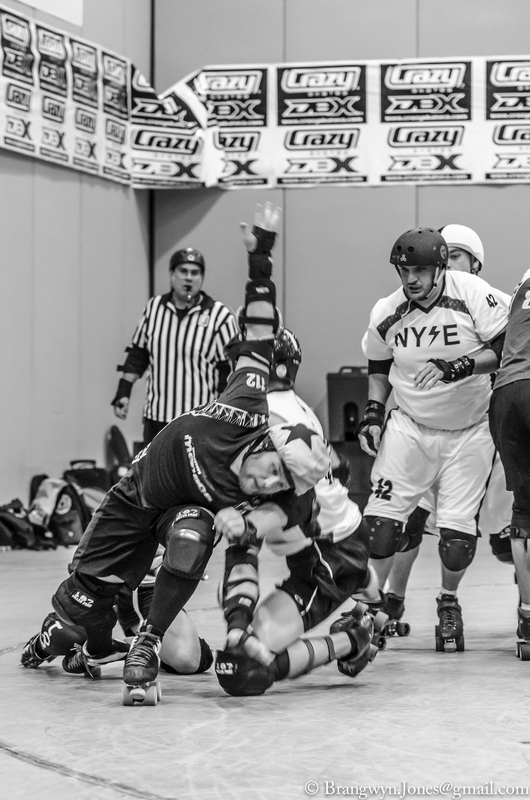 PS Check out the NYSE v Maelstrom match-up on WFTDA.tv at 1p PST on Saturday at the MRDA Championships. Thank you to Brangwyn Jones, Tyler Shaw, and Hispanic Attack for the photos in this blog! You cannot ignore Puget Sound Outcast Derby. Mostly because their uniforms demand your attention, but also because that jersey is probably going by you at Mock 5. 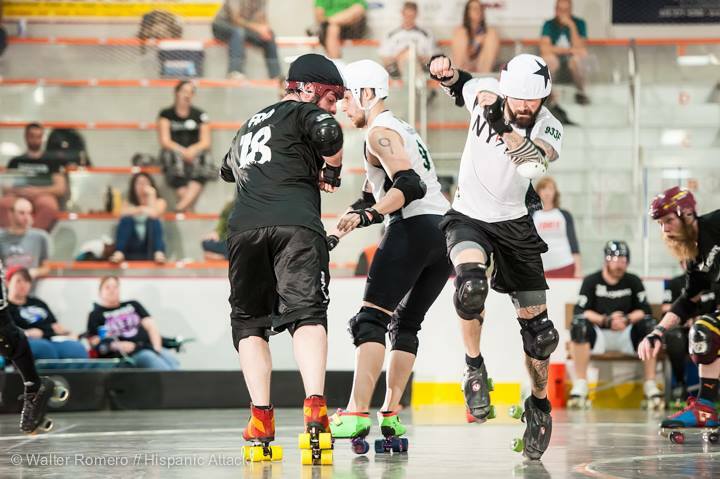 The Outcasts are a team of World Class level roller sport athletes that have come together for the love of derby. Ball and cane, speed skating, hockey, artistic, aggressive inline, downhill racing – these are all the sports (and I may have missed some) that the men of Puget Sound have competed in. When you watch them play, you can’t help but notice their sheer skating talent and balance; they do not fall. They are hard to push out of bounds. They are hard to out skate. 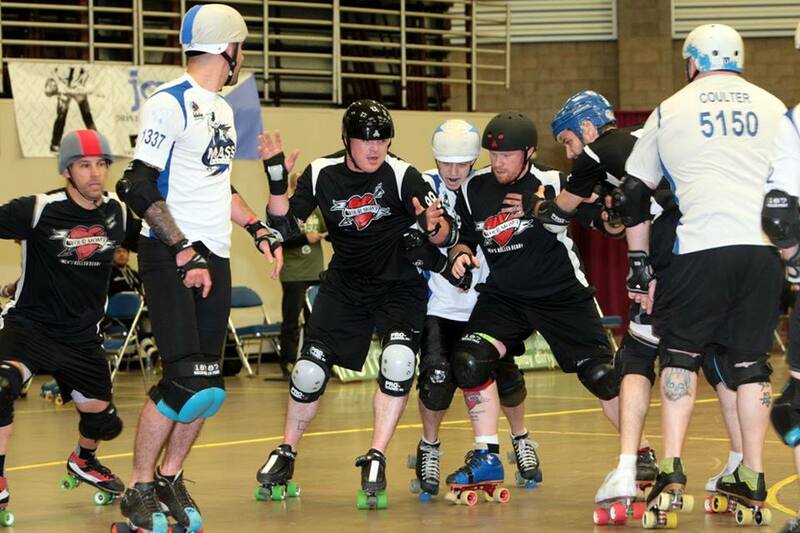 The longest-establish West Coast men’s derby team, Puget Sound is no stranger to the Championship tournament. They have qualified for Champs each year (and even finished #2 in 2011 against New York Shock Exchange), and plan on making a rise above their #4 seeding by the end of this weekend. As host of the tournament, Puget Sound seems to be trembling with excitement to show the world that they have been focusing on their weaknesses and developing game plans for each opponent they face. In the past, Puget has seemed to rely on their straight-up talent to win their bouts. They are so much fun to watch, but when I have seen them play (Mohawk Valley Cup in 2013 and then streaming at Champs), I have noticed a ‘superstar’ style of play. They have relied less on walls and tightly-bound defense, and more on big, driving hits, pulling cut tracks, quick bursts of speed, and out-skating the opposition in the past. To continue to dominate, Puget knows they must shift into a team-based style of play. Scott Slamilton’s artistic background make him nearly impossible to capture. Blockers like Bonus Jonas and Dilly Dally are small and unassuming to look at, but their agility on wheels only enhances their ability to pop into larger opponents to stop or redirect an opponent’s momentum. (small blockers – watch these two this weekend. Take notes. Learn things.) With such a variety of sizes on the bench, Puget can really tailor their lines to take on individual jammers to play to strengths. Need pure power and size? Put out Big Bill and Radiallac. Need stronger walls and communication? Put out Quadzilla, Low Rider, and Thunderstruck. If you need blockers who can chase and re-capture a wiley jammer, you put out Cory Pain and Chuck Hendrick. 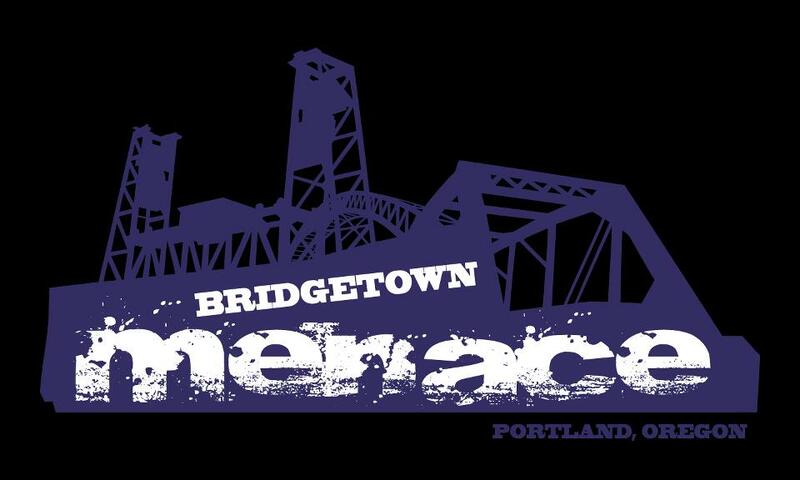 In the first round of play this weekend, Puget Sound gets to face their little brother, Bridgetown Menace. Bridgetown has been steadily closing the point gap between PSOD and themselves each time they play. Puget needs to focus on communication and containment against Menace if they want to continue their winning streak. Both teams are very fast and very sharp, neither waste energy in their hits or skating. No more can Puget rely on being a team of simply more talented skaters. Menace is coming in with a point to prove, and Puget Sound has an opportunity to show that they have learned from their past match-ups. Puget has a chance to finally solidify being a collective team of insanely talented skaters that know how to read each other and trust each other. Puget has a chance to show the world that they are here not just to play. They have a chance, and a desire to walk away as the host of the Championship tournament where they will leave with more gold around their neck than just what is on their uniform. Check out Puget Sound’s Facebook for updates and awesomeness. Thank you, Eric Lyons for use of ALL the photos in the article. Tune into WFTDA.tv at 3p PST to watch Puget Sound work their fancy feet magic against Bridgetown Menace. I first saw Bridgetown play at Spring Roll 2013, and fell in love with their hard hitting style of smash ‘em up roller derby. 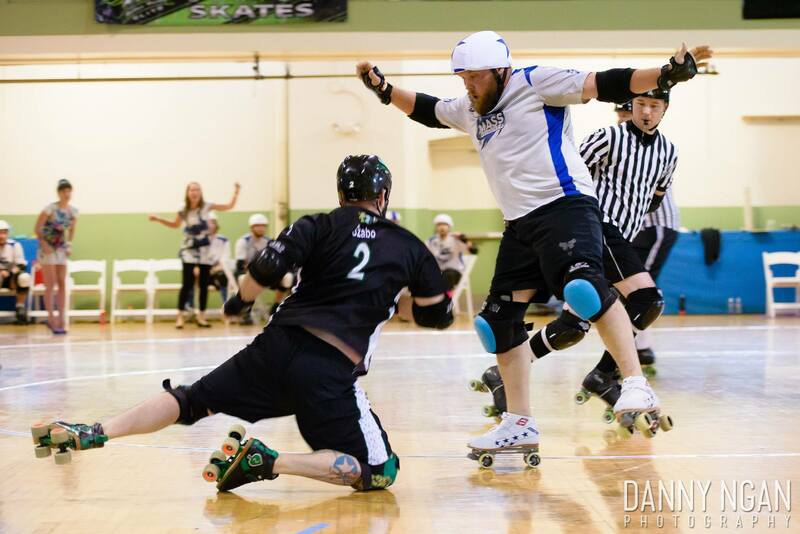 Every Menace player skates like they’re 6’2” and 220 pounds of pure muscle and agility. 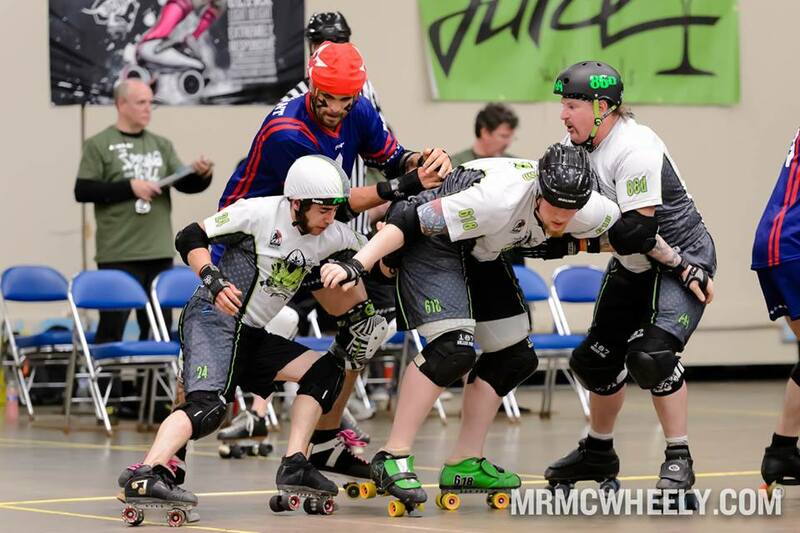 They made a very good showing at Champs last year, muscling through opponents and letting Shreddy Mercury dance around the opposition. You could tell their wall work needed some time, and that there were some overall trust issues on the floor that did not play to their advantage against Puget in the 5th place game. 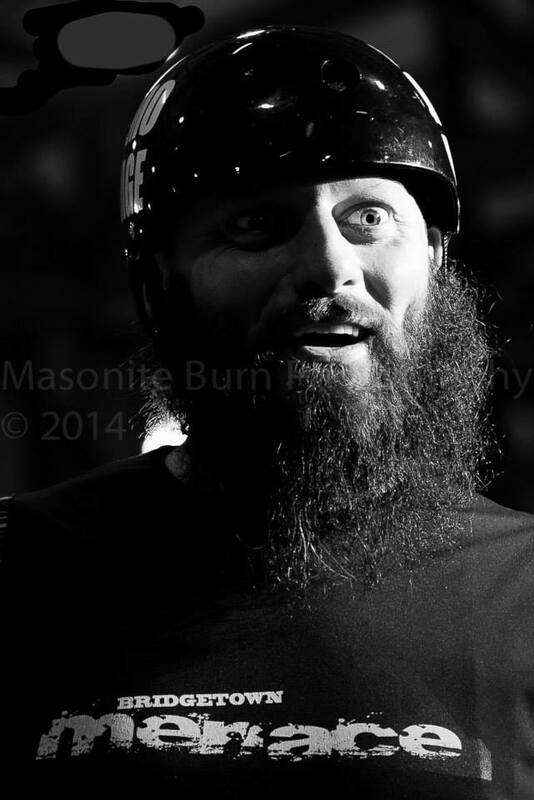 Unleashing the power of the beards. I was super stoked to see Bridgetown play live again. I am a fan, it’s absolutely true. Cozmo Damage is a monster blocker who always seems to be one step ahead of the jammer, Juke Blocks Hero is a force of reckoning in a pack, and Don Juan the Devaskater is just pure fun to watch with his power-jam skating maneuvers (he and No Big Deal of Maelstrom have a very similar strength-jam style). Having a packed audience of people who are all derby literate is the best live experience you could ask for. It’s awesome knowing that the RC volunteers are turning people away at the door because they can’t fit any more people in that room. It was a good thing for men’s derby because so many people got to witness some really competitive match ups. It was a good opportunity for people who might not normally watch men’s bouts to see how great it can be at a high level. Playing against the #2 and #3 teams as the #6 team is a win-win situation. We have nothing to lose there, and get a chance to see where we fall against the best teams. It’s a bonus that we get to play against people that we like. It was great to feel where we excelled and nice to have St Louis exploit a weakness with a couple months to fix it. The timing of those competitive bouts were invaluable in preparing for Champs. For me. 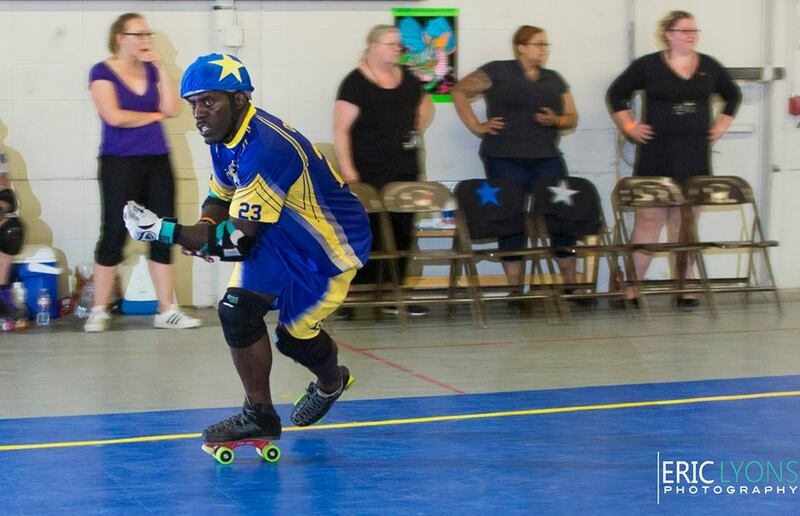 jammer Elysium made a huge impression with his maneuverability and endurance in both bouts. He was able to crack walls and twist around the super-strength of the GateKeepers. Rob Lobster, who had only recently returned to derby, looked like he hadn’t been out on injury at all (much less something draining like chemotherapy). His non-verbal communication and trust in his teammates meant that when a wall had him in it, the opposing jammers had to work much harder. Side note: Rob’s actually receiving chemo treatment THIS WEEK, and will still play at Champs this weekend. For more info on all of that, please go and join the #TeamLobster Facebook group and then visit Left Turn Clothing to order Team Lobster shirts. Cosmo Damage makes himself even bigger to stop NYSE. Photo by Brangwyn Jones. 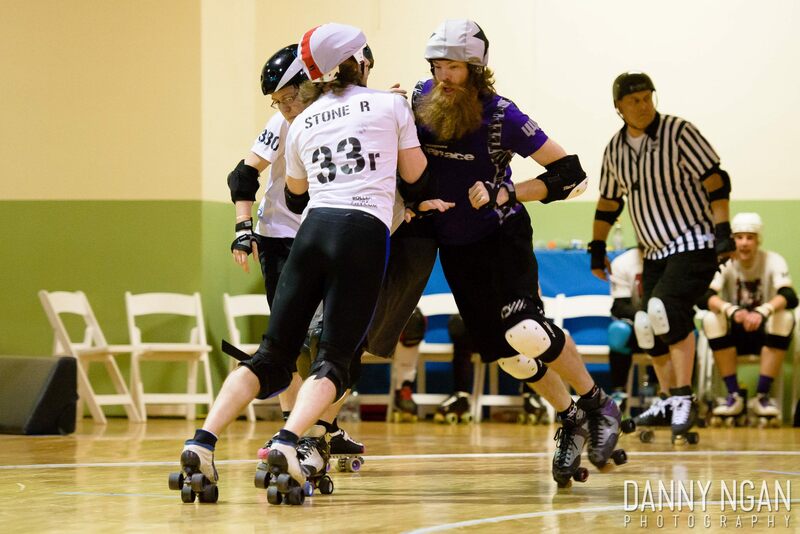 The first round of Championships finds Bridgetown facing an old friend: Puget Sound Outcast Derby. Like NYSE and Maelstrom on the east coast, Menace and the Outcasts have found themselves toeing up several times a season for a few years. This year these two met at the Big O and at the Rat’s Nest, after having finished the season 2013 in the battle for 5th place at MRDA Championships. So far, the Outcasts have come out victorious in each battle, but their margin of win is diminishing. At champs in Sioux City, Menace lost by 35 points. At the Big O, they lost by 21 points. 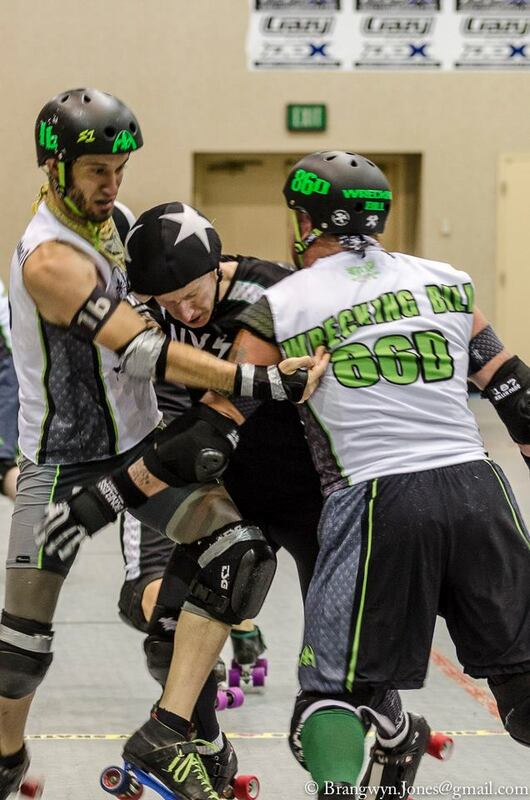 At the Rat’s Nest in August, Menace lost by TWO POINTS. Shreddy Mercury is the first. 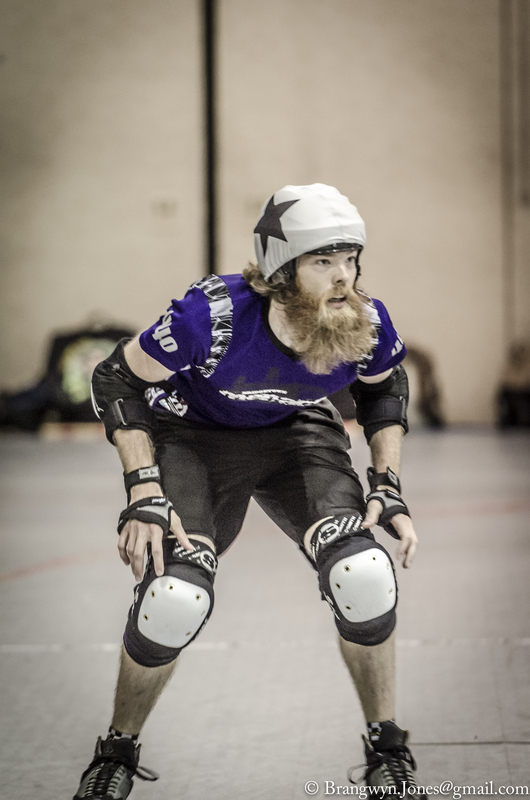 He’s absolutely one of the best jammers in Roller Derby. I believe Cozmo Damage has elevated to an all-American blocking level. He has some of the best blocking technique in men’s derby. Sam Miller of course is always so fun to watch. He has a style unlike anybody else, and makes our team very dynamic.Some other fan favorites are Juke Blocks Hero and Demolition Man. So much charisma there. However, the real star of our team is our teamwork. If there is any reason to be a fan of Menace, it is the way we play together. I think we have the strongest team-play among the top teams. Cozmo Damage. Photo by Masonite Burn. Check out the Bridgetown Menace facebook to keep up to date with them, and to request to buy some of the merch that they are (apparently) going to be selling hella cheap this weekend at Champs!! If you’re not going to be at the Tacoma Armory for the event, make sure you tune into WFTDA.tv at 3p PST to watch the epic battle between Bridgetown and Puget Sound!